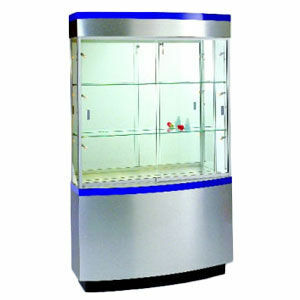 Dimensions: 48" x 15.5" x 80"
A pre-assembled rectangular curved wall display case. Curved canopy and curved base cabinet. Shown in brushed silver laminate with upgraded blue stripe with flat silver anodized aluminum frame with optional micro halogen spotlights. Enjoy 8.5 square feet of elegant shelf space for your products. The following features come standard on cases.This product will be shipped VIA common carrier. Freight will be quoted separately. You will be notified of the freight amount.